There’s worrying news from the election for president of Ireland where support for the second placed candidate, Peter Casey, surged after his racist comments about Travellers. Saturday’s vote gave incumbent president Michael D Higgins an overall majority with 55.8% to secure – as widely expected – a second term of office. Higgins has stood twice as an independent but was a leading figure in the centre-left Labour Party. But behind him, millionaire business tycoon Casey – one of the investors on the Irish version of TV show Dragons’ Den – has seen his vote surge from between 1% and 2% in recent opinion polls to a huge 23.3% after his widely reported comments just 10 days before the election. This is a rise from almost nothing to nearly a quarter of voters. Casey attacked Ireland’s official recognition of Travellers as an ethnic group as “nonsense” and said they were “basically people camping in someone else’s land”. In a classic racist turn of phrase he said Travellers reduced property prices in areas where they lived. Casey sought to scapegoat Travellers in his appeal to “middle Ireland”. In fact Irish Travellers face serious poverty, disadvantage and racist discrimination in Ireland. It is very alarming that Casey’s support seems to have rocketed in the wake of his racist remarks. 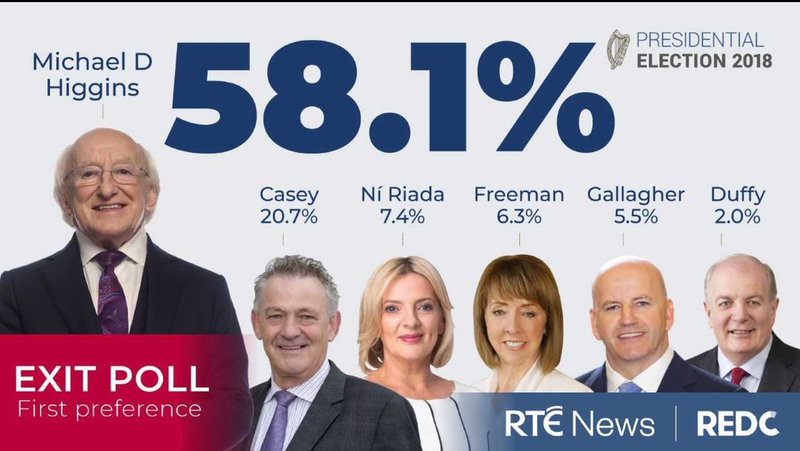 His opinion poll figures during the campaign put him last after Sinn Féin candidate Liadh Ní Riada and three other independent candidates (including two more Dragons’ Den tycoons). With his nakedly racist pitch, Casey seems to have suddenly crystallised a substantial second place vote. A chunk of this looks to have reduced Higgins’ vote by around 10% or so compared with earlier opinion polls, with a few points also picked up from other candidates. There is no doubt that there was a protest vote in this election that played to the advantage of one candidate and that not all of this protest vote should be equated to being motivated by prejudice against Travellers. However, it is important that we also do not gloss over the fact that one candidate sought to exploit prejudice against a small and marginalized community – the Traveller community in Ireland – for his own political ends and the warning that this sends out to the political system in Ireland. There is a complacency within the public discourse in Ireland that somehow we are immune to the nasty populism evident in other European countries and beyond and that we do not have a problem with racism in Ireland. Antiracists should hear the alarm bells loud and clear. Casey’s poll surge suggests a racist groundswell that can find political expression – and he has already hinted that he could make further bids for elected office. His campaign will have given confidence and legitimacy to racists in Ireland. But there should be no place for racism directed at Travellers or anyone else.